Rick and Roberta chat about some history of beer, the brewing process, and some fun facts. See what social media users said were their favorite beers. Do you have a favorite? Comment below the video and share. Thank you for all who chimed in. A follower messaged me and wondered where my post was on beer, since I put the Halloween themed wines up. This weekend I tried a few great brews while discussing future plans with my brother. 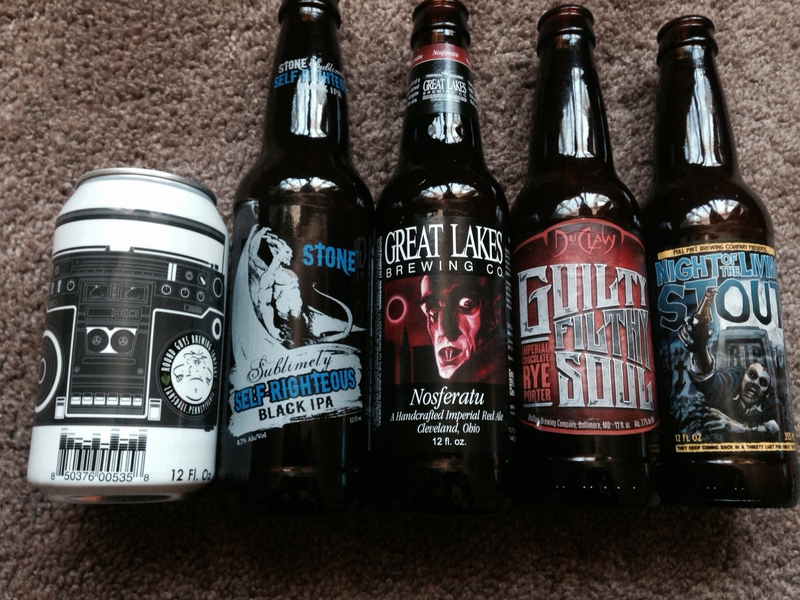 From left to right: Round Guys Brewing Company, Stone Black IPA, Great Lakes Brewing Nosferatu, Guilty Filthy Soul Rye Porter, & Night of The Living Stout. As a homebrewer myself I’ve appreciation for the varieties. They all tasted great and were perfect for discussing the future of sCrypt Comics and where we’d like to go. Do you have any recommendations? As you may or may not know, the wife of sCrypt Comics’ co-founder Rick Pipito, is a master in the kitchen. Her expertise in food, beer and wine has attracted a large audience in the past year, bringing her up close with the likes of Lidia Bastianich, Mario Batalli, Anne Burrell, and more. She has also been a contestant on ABC’s The Chew & NBC’s 10 Show Top Philly Chef, as well as had access to major food, wine and beer press events. What does this have to do with our blog? Nothing. BUUUUTTT, in my travels to the comic book store, I found something of the perfect gift for her tastes and mine. Behold, A Wonder Woman apron. I’ve been wanting the Batman one for myself for when I cook on the grill, but since she is much more skilled than I in the likes of kitchen mastery, I felt she needed one first. You can find these character aprons at many comic book retailers and online. If you are a food, wine or beer person, or know someone that is, please check out her blog as well and follow her. Send her a line, say hi, and tell her where you heard about her. www.homemadedelish.com. Roberta has had a great amount of creative input and criticisms in my work, and I’m proud to have her in my life.